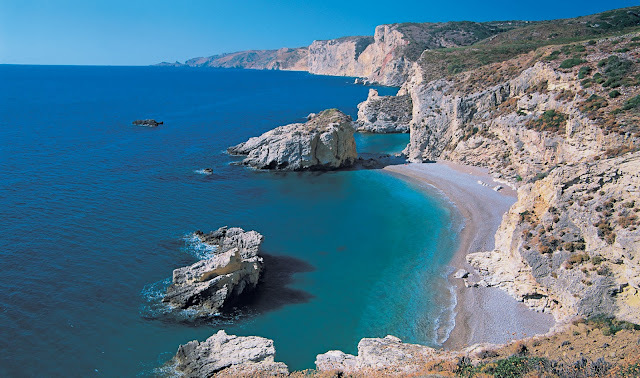 Kythira (Greek: Κύθηρα, also transliterated as Cythera, Kythera and Kithira) is an island in Greece lying opposite the south-eastern tip of the Peloponnese peninsula. It is traditionally listed as one of the seven main Ionian Islands, although it is distant from the main group. Administratively, it belongs to the Islands regional unit, which is part of the Attica region (although at large distance from Attica itself). Kythira has a land area of 279.593 square kilometres and it is located at the southwestern exit from the Aegean Sea, behind Cape Malea. The rugged terrain is a result of prevailing winds from the surrounding seas which have shaped its shores into steep rocky cliffs with deep bays. The island has many beaches, of various composition and size; only half of them can be reached by road through the mountainous terrain of the island. The Kythirian Straits are nearby. Pretty amazing color in that water. Breathtaking photograph!